Somewhere it is written, “a prophet is not without honor save in his own country.” The same thing might sometimes be said of a business enterprise, that it is not without honor save in its own city. While this is not true of the Gorham Manufacturing Company and other Providence enterprises, it is well that we sometimes cast about us and re-contemplate what a powerful influence our business organizations are exerting in the commercial world. Gorham silverware, for instance, is a world-known product. It has widened and extended its influence to an astounding degree ever since Jabez Gorham started the modest manufacture of silverware in his little shop on Steeple street in 1831. Since then several generations have bought, owned and used Gorham silverware, and the Gorham Manufacturing Company has made and is making to-day silverware that will be valued and prized by its possessors for generations to come. This applies not only to America, but to the art centers of the Old World where Gorham silverware is used, and where the productions of Gorham workers will be found occupying places of prominence. It is a long step from the little shop of Jabez Gorham to the wonderful modern equipped factory of the Gorham Manufacturing Company, and such a marked development could come about only through a combination of commercial foresight and artistic genius. 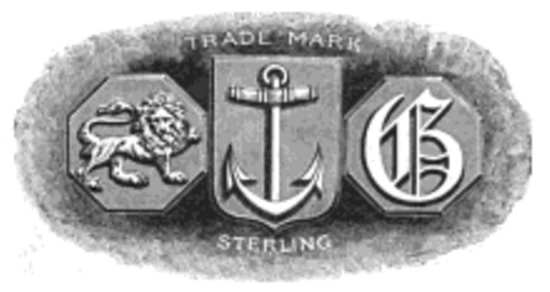 In the first place, Jabez Gorham founded the business upon the highest ideals of commercial honesty, and the sterling silver trade mark of the company Lion-Anchor-G – carries with it the stamp of commercial integrity. It is known everywhere and is accepted everywhere without question as to quality and as to the purity of the metal it marks. This trade mark backed by the principle, has naturally won and held the confidence of the six thousand or more jewelers of the United States through whom the Gorham wares are distributed. In addition to this, Jabez Gorham backed his enterprise by artistic workmanship, and adhering to this, has also kept The Gorham Company on a firm and progressive footing. Artistic genius, craftsmanship, has been and is the soul of sterling silverware, and The Gorham Company has always recognized the necessity of unhampered individual effort in the production of useful and artistic silver commodities. The late Edward Holbrook was the man who for many years took up the big task of developing and broadening this business, and through his personal efforts and foresight it has grown to its present huge proportions. Speaking of unhampered, individual effort leads one to say a word about this company’s plant and its diversified efforts to cooperate with the workmen. The plant itself embraces some thirty acres of ground, situated in suburban surroundings. The manufacturing buildings are constructed upon commodious lines and offer plenty of air, light and sunshine to the workmen. The various departments are equipped with up-to-date labor-saving machinery, and are so arranged as to easily transfer from room to room the work in its various stages of manufacture. The designing rooms are purposely situated away from the hum and buzz of machinery, allowing the designer peace and quiet to work out his ideas. The Casino, a separate building, is maintained for the convenience and comfort of the employees. It embraces a large central dining-room on the main floor, where a meal may be purchased at cost or where lunches may be eaten at noon. A reading-room and library and a rest-room for the exclusive use of the women employees are on the same floor, and bowling alleys are operated in the basement. Everything possible is done to insure healthful, pleasant and comfortable surroundings, and every effort is made to make the employees feel that they merit recognition as individuals. The company recognizes that the success and happiness of the individual is as essential as the success and development of the business and that one hinges upon the other. While the fame of Gorham silverware and goldware have become world renowned, possibly the various other pursuits of The Gorham Company are not so well known, although much work is done throughout this country. Monumental bronze work, for instance. Many of the most famous statues and groups now occupying places of prominence in the various cities throughout the United States were cast in the Gorham bronze foundry. This department of the business also furnishes memorial tablets in both bronze and brass, and much architectural bronze for purposes of construction. Then there is the ecclesiastical department, devoted to the designing and making of fonts, pulpits, lecterns and, in fact, everything that is necessary to be used in or to adorn a church. It is prepared to equip a church throughout. This includes the designing and making of memorial windows. The church and memorial window work of the company, done in stained glass, is on a par with the high excellence of the other artistic work turned out. In both the “American” and “English” schools The Gorham Company has acquired a high reputation. Each year brings forth new problems and new demands. The Gorham Company is always alive to new issues. It keeps pace with new and changing art and design, and the ingenuity and artistic ability of the Gorham craftsmen can be counted upon at all times. Paul said, “I am a citizen of no mean city.” We re-echo this for Providence. The good men and women of Providence can be proud that The Gorham Company is a Providence institution, that this great work is conceived and wrought in Providence and that the great works of Gorham art scattered throughout the United States and the world are the consummated skill of Providence workmen. Providence, R. I., June 26.–The reorganization of the Gorham Mfg. 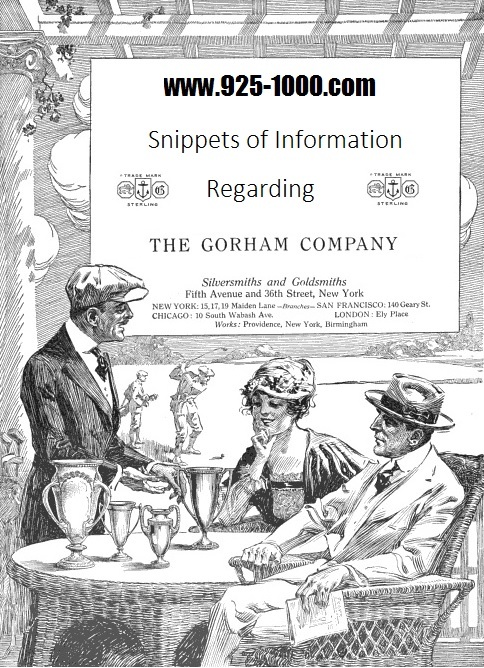 Co. and the various co-ordinate silversmithing corporations that are associated with it as subsidiaries of The Silversmiths Co., persistent rumors of which have been current in business and financial circles here since the first of the year, assumed definite form this week through the announcement issued from the Elmwood offices of the Gorham Mfg. Co., Wednesday afternoon, following the regular meeting of the board of directors. As a preliminary step to the reorganization several important changes in the personnel of the officers and directors of the Gorham Mfg. Co. were contained in Wednesday's announcement. When the entire plan has been put into operation it will include the eventual elimination of the Silversmiths Co., which for several years has been the holding corporation of the several concerns that are embraced in that combination and which have been controlled by it. The plan also provides in place of the Silversmith Co. the taking over of all of these manufacturing plants by the Gorham Mfg. Co.. thus making the Providence corporation the "parent or holding company." It is explained in the announcement that all of the companies in the combination, without exception, have just completed the most prosperous year of normal business in their history, and that the outlook for the future was never more promising. The purpose of the plan of reorganization is to put the business of the Gorham Mfg. Co. and the affiliated companies upon a more efficient and economical production basis and at the same time to consolidate the financing of the separate corporations in such a manner as to insure stability and provide for necessary expansion, due to the constant growth of the business of all of these allied interests. Greater manufacturing efficiency is to be achieved by eliminating duplication of plant and products. Each subsidiary corporation will, however, maintain its present entity as a selling organization under the direction of its own officers. Plans for the additional financing of the reorganized Gorham companies are being worked out by the committee on reorganization and finance. The program recommended by this committee at the meeting of the directors on Wednesday, contemplates the strengthening of the whole financial structure. ' The accounting systems of the various affiliated companies are being coordinated under the direction of Hawkins & Sells. Recent appraisals of the companies' New York city real estate holdings place their present actual values at more than double the figures at which they are carried on the books. A complete appraisal of all the companies' real estate, plants, equipment and other properties is under way and is expected to show similar excess of values over the book figures in many instances. At the meeting of the Board of Directors on Wednesday, John S. Holbrook, who succeeded his father, the late Edward Holbrook, as president of the Gorham Mfg. Co., resigned that position to become chairman of the Board of Directors, a new position that has been created under the plan of reorganization, while Henry A. Macfarland has been elected as president. Alfred K. Potter, of this city, has also resigned as vice-president and director to take effect October 1, 1920. Mr. Holbrook will continue as president of the Gorham Co. of New York and of the Silversmiths Co. The companies that will be affected by these changes are, in addition to the Silversmiths Co. and the Gorham Mfg. Co., the following concerns: The Gorham Co. of New York; the Mount Vernon Co. Silversmiths, Inc., Mount Vernon, N. Y.; the William B. Durgin Co. of Concord, N. H..; the Whiting Mfg. Co. of Bridgeport, Conn., and the William B. Kerr Co., of Newark, N. J. The new office of chairman of the Board of Directors was created for the purpose of relieving Mr. Holbrook of the executive details involved in the direction of the company's manufacturing and selling operations, and leaving him free to devote his attention to the broader field of the corporation's finances and the shaping of its policies. H. A. Macfarland, who succeeds Mr. Holbrook as president of the Gorham Mfg. Co., it was announced, will take the entire direction of the manufacturing and selling departments of the company's business. He was, for several years, president of the Mount Vernon Co. Silversmiths, Inc., of Mount Vernon. N. Y., one of the corporations associated with the Gorham Mfg. Co. in The Silversmiths Co. of New York. Mr. Macfarland has built up the Mount Vernon Co. in a very brief time into a rapidly growing and very prosperous business. As vice-president in charge of production of the Silversmiths Co., the holding corporation in which the Gorham companies and several other silver manufacturing companies are affiliated, his success has been such as to warrant his promotion to the presidency of the Gorham Mfg. Co. He is a director in that corporation as well as in the Gorham Co., the New York selling organization, and is president of the Sterling Silverware Manufacturers' Association. The resignation of Alfred K. Potter as vice-president and director was accepted by the board of directors, to take effect Oct. 1, 1920. Mr. Potter, who became treasurer of the Gorham Mfg. Co. in 1918, was promoted the following year to the vice-presidency of that corporation and of the Gorham Co. of New York, in both of which he was a director, as well as of the Silversmiths Co. Mr. Potter has been in charge of production in the Gorham Mfg. Co.'s plants. At the meeting of the directors of the Gorham Mfg. Co. on Wednesday, as well as that of the Silversmiths Co., held thereafter, the report of the committee on reorganization and finance of the latter corporation was received and adopted. This committee consisted of Frank W. Matteson, chairman: John S. Holbrook, William A. Viall, Herbert J. Wells and James S. Utley, and recommended a plan which will eventually eliminate the Silversmiths Co. and make the Gorham Mfg. Co. the "parent" or holding company for the Gorham Co., the Mount Vernon Co. Silversmiths, Inc., the William B. Durgin Co., of Concord, .V. H.; the Whiting Mfg. Co., of Bridgeport, Conn., and the William B. Kerr Co., of Newark, N. J., all of which are now subsidiaries of the Silversmiths Co.
All but the Gorham Co. manufacture in their own plants and sell through their own organizations special non-competitive lines of sterling and plated silver, bronze and other products. The Gorham Co. is the New York retail selling corporation, operating two stores in Manhattan, through which the products of all these companies are marketed locally. A patent has been granted to William F. Kingman, of this city, for a design for the handle of forks, spoons, etc., which he has assigned to the Gorham Mfg. Co.
John H. Ring, of this city, assignor to the Gorham Mfg. Co., has been granted patents on two designs for dishes, platters, or similar articles. James Costigan. 23 years of age was sentenced to 60 days in the Providence County Jail in the Sixth District Court last Friday on an old charge of carrying concealed weapons. The action of the court followed a recent episode in which Costigan figured with the police when he is alleged by them to have posted a sign in one of the work shops at the Gorham Mfg. Co.'s plant at Elmwood saying that the plant would be blown up on a certain date. He claimed that it was done as a joke, but while he is serving sentence the authorities will consider whether they will allow it to pass as a joke. The Gorham Mfg. Co. is planning to begin operations in a portion of its new plant near Phillipsdale, in East Providence, by the middle of this month. This plant, when completed, will include more than a score of buildings, covering approximately 67.000 square feet of ground, to be used entirely for munition work. Edson P. Howard for a number of years with the Gorham Mfg. Co. died last week at his home 28 New Fenner Ave., Arlington, R. I., in his 72nd year after a lingering illness. He is survived by his widow and three sons. Henry Farmer, 56 years of age, employed by the Gorham Mfg. Co., received a fracture of the skull when hit by a flying piece of steel while at work, at the company's plant Wednesday afternoon. He was at work operating a hydraulic press when the accident occurred. Richard E. Peters, foreman of the department, at once summoned Dr. Kelton, who ordered the injured man removed to the Rhode Island Hospital. There was a goodly number of moves on moving day (1st May) in the trade. The magnificent Hays Building, Maiden Lane, now completing, will be the location of many prominent houses in the trade, with the Gorham Manufacturing Company upon the ground floor, and the well-known American Waltham Watch Company on the second and third floors. The building is, as many have described it, a credit to the jewelry trade. Providence, R. I.. April 26.–John A. Corey, for 35 years an employe in responsible positions of the Gorham Mfg. Co., died Wednesday after an illness of four weeks from a complication of diseases. He was in his 52nd year, and was well known in military circles throughout the State. He was born in Providence, June 4, 1867, the son of Daniel E and Emily Corey. He was educated in the public schools of this city and entered the employ of the Gorham Co. as an apprentice at its old plant on Steeple and North Main Sts. shortly after leaving school, remaining in the employ of the company until his death. Major. He returned to active service June 7, 1916, when he was elected Captain and Adjutant of the First Light Infantry Regiment, resigning that office Jan. 8, 1917. During the Spanish-American War he served as Quartermaster Sergeant of Battery A, under Captain Edgar R. Barker, during its tour of duty at Quonset Point. He was a member of Sydney F. Hoar Camp, United Spanish War Veterans. He is survived by four sons, one a member of the Canadian Engineer Corps, now on his way home. His wife died several years ago. The Gorham Manufacturing Company.– The vantage ground of art is as wide as the field of thought. Its theory or practice enters into all the complications of life, and obedience to, or even regard for, its laws shows the possession, not only of a higher education, but also of the highest appreciation of all that comprises man's enjoyment and well-being. Art is aristocratic, but not exclusive. It stands forth in the sculptor's model, and in the painter's masterpiece, and, also, in the handiwork of the artisan, whether he fashion drain-pipe or royal jewel. When these plantations were new the highest in art – in nature – was present to cheer and lead up. As time went on, and something more than a support of existence was the product of labor, cunning workmen began to copy what was so lavishly strewn around them. Gothic art, rude as it was, began to grow ; the forest arch entered into the construction of buildings and the bough's line of beauty appeared on door-posts and lintels, and the leaf and the fruit had representation on table ware of unpolished clay. As the colony increased and its wealth mounted up, there was a reaching out for something beyond itself. The spirit of the times was in advance of the possibilities of the colonists. They did not long for the flesh-pots of Old England, but when surplus silver began to accumulate, the treasures of the mother country found their way thither. Very paltry in value those relics may have been, but their possession indicated wealth, as wealth was then regarded, and what is more important, their acquisition signified the appreciation of qualities not included in intrinsic value or usefulness. At first the oaken settle, the "pewter" ware, and the wooden trenches were sufficient. Later, better things were made at home, and in the welcome ships came silver spoons, brass warming-pans, sugar bowls, silver candlesticks, curiously wrought salt-cellars, and pieces of furniture of carved mahogany. These were so highly prized that they were included in inventories of property, and this estimation in good part was based upon the fact that they were, for that time, indeed, for all time, products of art, – that they possessed a quality which attracted, lifted up, made better, educated. It may be claimed that this has little relation to what is technically recognized as art, but if this desire for the beautiful does not show the presence of art, it at least indicates the possession of the art idea, which is art's builder. The artificers of any time are always in advance of the idea, and lead it on and up to a standard more perfect. This has been going on for two hundred and fifty years on our own soil, and the result is to-day that we may boast of the highest attainment in art, and of the highest type of purveyors to the art idea, or to art itself. Thus the Gorham Manufacturing Company stands to-day, in its relation to the people, where the ambitious, though comparatively rude artificer stood in the earlier days of the commonwealth – in the position of educator and leader to greater refinement and more exact culture in the arts. Its growth and the fame of its productions have been a source of pride at home and of wide commendation abroad. Its rise is due to the energy and care in building, characteristic of the founders, and their gifts of mind, or their adaptability to the mastering of the mechanic arts which they sought to control. One man may make a spoon, and another man may make a spoon. Both are spoons in one sense, but they are wholly at variance except in name, and while one is considered a valuable acquisition, independent of its coin value, the other is only bullion. It is simply a matter of taste, – that indefinable, yet essential quality, that ministers to the senses, – educated and refined. It may be said, in truth, that the Gorham Manufacturing Company owes a good share of its popularity to the exercise, on the part of its builders, of taste in the aesthetic sense, – of that nicety of discrimination not introduced into, but born with, the soul. Another acknowledged factor, possibly the foundation of all, is the company's library. It is varied and extensive, abounding in works of art pertaining to sculpture, painting, architecture, and kindred subjects. The object of the designer who studies is not to copy. Originality,– another factor,– must be the outcome at any cost, and as he looks upon the engraving, or reads its history, he catches the spirit and enthusiasm of its maker, and copies not what the artist or sculptor has painted or chiseled, but that which, unexpressed, remained in his mind. Taking up the ideas unexpressed, which must have been present to produce what is before the designer, he, the designer, gives them expression in another and different channel. The operations of the company are not confined to the manufacture of gold and silver ware, but has extended to include work in other metals, the memorial in bronze to Senator Anthony being a late production. Jabez Gorham, the founder, was born in Providence, Feb. 18, 1792. He served an apprenticeship of seven years, to a jeweler, and on reaching his majority entered into partnership with Christopher Burr, William Hadmen, George G. Clark, and Henry G. Mumford. About five years afterwards these business relations terminated, and Mr. Gorham continued the business alone, and at the place occupied by the firm, on the corner of North Main and Steeple streets. Within a year or two he removed to Steeple Street, to a smaller building, the nucleus around which gathered the various structures constituting the present manufactory. The jewelry business was carried on here until 1831, when silver spoons became a specialty. Until 1840, the product was spoons, chiefly, although thimbles, combs, and occasionally napkin rings and forks were made. The firm at this time was Gorham & Webster, and later it became Gorham, Webster & Price. An old print shows the little shop with these signs upon it: "Gorham, Webster & Price. Silver Spoons and Jewelry," and " Silver Thimble Manufactory." At this time the American House, afterwards known as the Earle House, occupied the southwest corner of North Main and Steeple streets. At the age of fifty, Jabez Gorham retired from business and was succeeded by his son, John Gorham. The father died on March 24, 1869. John Gorham, born in Providence on Nov. 18, 1820, became first a partner in the business on the retirement of Mr. Webster, and, in 1847, the sole proprietor. In the meanwhile the industry had taken great strides in advance, not only in the extent of manufacture and in merit of product, but also in methods and facilities employed. In 1850 the manufacture of hollow ware was begun, and every variety of silverware for use or ornament. In February, this year, Gorham Thurber, cousin of John Gorham, became a partner, and the firm was known as Gorham & Thurber. Between this time and 1852, Lewis Dexter was admitted to partnership, and the firm name was changed to Gorham & Company. In the meantime, Mr. Gorham went to Europe and visited the establishments of the chief silversmiths, and in a manufactory in London he worked three weeks by the side of a moulder skilled in his art, that he might acquire knowledge of the details of fine moulding. He also secured several artisans, adepts in their specialties, for service in the home manufactory. Mr. Gorham returned in 1852, and the result of his study and labor abroad was apparent at once. Its expansion and prosperity continued up to the beginning of the war of the Rebellion, at which time two hundred persons were employed. Mr. Dexter retired from the firm in 1861. In May, 1863, the Gorham Manufacturing Company was incorporated. John Gorham was elected president; Gorham Thurber, treasurer; and J. F. P. Lawton, secretary. The capital was $300,000, and in May, 1872, was increased to $600,000, the limit being twice the amount. The capital at the present time, 1886, is $1,000,000, with a surplus. In 1872 the number of persons employed was 450, and the manufactory had been increased to occupy all the area included between North Main, Steeple, Canal, and Friend streets, except a small building on the corner of North Main and Friend streets. In January, 1878, Mr. Gorham resigned the office of president, and was succeeded by William H. Crins, the other officers mentioned continuing to serve to the present time. George Wilkinson is superintendent of the works, and Edward Holbrook is the New York agent of the company. The number of employes at the present time is over seven hundred and fifty. The manufactory is one of the wonders of the country if not of the world. It is a labyrinth of work-shops, forges, and furnaces. When its workmen and its countless appliances are in the fulltide of the day's work, the whole presents a picture,– a history of extraordinary interest. The equipment of the works is, in the highest sense, complete. Every labor-saving mechanical device known is employed, and the results of the latest researches, and discoveries in arts and methods akin, are kept pace with and introduced as soon as proved practicable. Steam is the great agent. Innumerable odd-shaped, odd-moving machines contribute to the general result–" machines for rolling, shearing, milling, punching, shaping, and embossing; ponderous dye-stamping machines, lathes, drills, and planing machines for wood and metal; foundries for casting iron, brass, silver, gold, and other metals; a blacksmith's shop; large rooms devoted to melting and refining furnaces, electro-plating and gilding, photographs, and metal spinning; rooms for artists, draughtsmen, engravers, chasers, embossers, die-cutters and die-hardeners, tool-makers, weighers, and packers, and case-makers in wood, morocco, and velvet." About twenty different trades are carried on, and to each boys are regularly apprenticed. Through all the mechanical complications and the various processes of manufacture the object in progress passes, as though regulated by clock work, so related, each to each, as to form a harmonious whole – a single machine, as it were, into which enters the raw material and out of which comes the perfected product. About 10 years ago Mr. Holbrook, full of enthusiasm, determined to introduce Gorham silverware into this country. He was an idealist. The Gorham manufactures, too, were ideal. The silver was something very different to what had been current here. There was individuality and artistic quality; a stamp of marked design about the separate pieces or sets which came across from America. There was a drawback, despite the artistic quality. The British hall-mark could not be placed upon foreign productions, and the public would not buy anything in silver unless it bore the indication of British manufacture. "The Lion," or leopard's head, was and is, predominant in the public mind. A factory in Birmingham was consequently taken and splendidly equipped, but, in my opinion, one of the greatest mistakes was made when the English house essayed competition on the ordinary lines. It was tempting, but unless you can produce something which is sufficiently telling in both design and price, failure will result. I have seen it with English houses. Anyhow, on Christmas Eve the English side closed down that factory and the London showrooms. To this end Mr. Franklin Taylor, the president of the Gorham Co., has been in town. He is a man with shrewd business ideas, keen views, and a broad outlook. I feel sure that had he been at the helm somewhat earlier the Gorham Co. would still be manufacturing here instead of selling out to Docker & Burn. As it is he came across to prepare for the end. Perhaps that is hardly the word to use, because we have not seen the last of Gorham silver. Personally I am sorry that such a venture should have to be terminated; for it takes more than knowledge and capacity to make good business men; there must be a leavening of ideals. Wallace Holgate, formerly in the refining department of the Gorham Mfg. Co., has started in the refining business at 21 Clemence St. under the style of W. Holgate & Co. The sword which was presented by the citizens of Albany to Commander Daniel Delehanty, the Governor of Sailors' Snug Harbor, at Staten Island, last Saturday, is a fine piece of workmanship of which the designers, James Mix & Sons, of this city, are justly proud. The making of the sword was placed in their hands by the Citizens' Committee and was manufactured from designs drawn by them, by the Gorham Manufacturing Company of New York. The cost of the weapon was $800, which is said to be the highest price paid for a sword of this kind, in the ornamentation of which no jewels are used. Gold and steel are the only metals which entered into its composition. The unique beauty of the sword lies in the hand work lavished on these gold ornaments. The funeral of Max Tatz, for 38 years in the employ of the Gorham Mfg. Co., was held last Monday from his home, 38 Carter St He was found dead in his room, following a long illness. He came to this city 40 years ago from Kiev, Russia, where he was born, and two years later he entered the employ of the Gorham company. Besides his sister he is survived by three sons and three daughters. A purse of $50 in gold was presented to Superintendent W. C. Patt, of the machine department at the Elmwood plant at the Gorham Mfg. Co., by the employes of that department, Friday noon. Mr. Patt is leaving the Gorham Co., having accepted a position of general manager of another concern. The presentation was made by Daniel Donahue, who pointed out the esteem in which the superintendent was held by his men. Adolph H. Guildbrandsen, who has been in continuous service in the employ of the Gorham Mfg. Co. for more than 40 years, was retired last Saturday and his name added to the long list of those who have been retired on pension. Mr. Guildbrandsen, who is 71 years old and enjoys fairly good health, is a native of Denmark, learned the trade of a silversmith in Germany, and, on coming to the United States, worked for a time for Tiffany & Co., of New York. Coming to Providence he entered the employ of the Gorham Mfg. Co., when its plant was on Steeple and N. Main Sts., where he worked until the concern moved to its present location in Elmwood. At closing time last Saturday Mr. Guildbrandsen's fellow shopmates gathered about him and presented him a silver-mounted silk umbrella and a box of cigars. Lawrence Dresscher made the presentation. Providence, R. I., July 15.–Charles W. Regester. a retired employe and for many years assistant foreman of the chasing department of the Gorham Mfg. Co., died at 9 o'clock yesterday morning at the home of his daughter, Mrs. William F. Bischoff, 89 Jefferson St.. Lakewood. in his 82nd year. Death was the result of two shocks, one of which Mr. Regester suffered on the train coming from Los Angeles, Cal., a few weeks ago. He was accompanied east by a daughter, Mrs. Clara A. Smith, of Los Angeles, with whom he had been spending the Winter. Mr. Regester was one of the famous corps of chasers that the Gorham Mfg. Co. used to boast could not be reproduced in the world, each being a master artist in metal work. He was born in Sheffield, England, famous for its silverware manufactories, Nov. 25, 1840, and there, after finishing a common school education, he learned the trade of a silver chaser in the atmosphere of that great silverware community. While still a young man he became identified as one of the leading experts in his native city and his fame was known and recognized in this country. In 1880, Mr. Regester was prevailed upon to come to the United States and settled in Providence, where he entered the employ of the Gorham Mfg. Co., then in its old plant corner of N. Main and Steeple Sts. With the concern he removed to its new plant in Elmwood and remained there until about 12 years ago, when he was retired on a pension. For several years preceding his retirement he had been assistant foreman of the chasing department. Since his retirement it has been his custom to spend the Winter in Los Angeles with two of his daughters, Mrs. Smith and Mrs. Jeffrey R. Monroe. His Summers he spent with his third daughter, Mrs. Bischoff, at Lakewood. He had made 14 trips across the continent. He is survived by the three daughters, five sons, 30 grandchildren and 16 greatgrandchildren. His wife died 22 years ago. The sons are Ernest W. Regester, Joseph H. Regester and Douglas Regester, all of Providence; Arthur J. Regester, of Shawomet. R. I., and Horace V. Regester, of Niagara Falls. A suit by the estate of Edward Holbrook, late president of the Gorham Co. and Gorham Mfg. Co., to recover on notes aggregating $140,000 made by the Mt. Vernon Co., Silversmiths, was filed in the New York Supreme Court last Thursday, through Dawes, Abbott & Littlefield, attorneys. The first claim is on notes of $20,000, signed July 29, 1918, and payable May 19, 1919; the second claim is for $10,000 made Nov. 22, 1918, payable in six months; the third is for $10,000, dated Dec. 12, 1918, payable on demand; the fourth is for $15,000 on Jan. 29, 1919, payable on demand. The other notes all payable on demand, were made as follows: $30,000 on Feb. 13, and $29,000 on Feb. 2, 1919. Except for the latter notes, all were signed by H. A. MacFarland, president. The others were signed by William H. Goodman, treasurer. Mr. Holbrook died May 19, 1919, and his executors made demand for the payment of the notes before bringing suit. It was recently reported that an application to dissolve the Mount Vernon corporation had been made, but the original proceedings that were started for this purpose were discontinued, though later action was taken under another section of the statutes to wind up the corporation with the directors as trustees, in this way avoiding receivership. No answer has been filed in the suit brought by the Holbrook estate and it is not probable that one will be for a short time. According to George Comstock of the firm of Olney & Comstock, attorneys for the corporation, the suit is welcome as an effort to straighten out certain matters between the estate and the company. The defense will be that the notes were paid by issuance of stock. The Mount Vernon Co., Silversmiths, succeeded to the business of several old concerns. The company was incorporated in the latter part of 1914, under the laws of New York with an authorized capital stock of $600,000 of which $200,000 was preferred and $400,000 common stock. The company was organized for the purpose of purchasing the Rogers Williams Silver Co., of Providence, R. I., and H. A. MacFarland, Inc., of Mt. Vernon, N. Y., taking the assets and liabilities of both companies, and for the purpose also of purchasing the assets of the Mauser Mfg. Co., Inc., of Mt. Vernon, N. Y.; the company was independent of and had no connections whatever with any silver company notwithstanding that the Gorham Co. was part owner and stockholder of the Roger Williams Silver Co., and H. A. MacFarland, Inc. In January, 1914, the company made arrangements to purchase the real estate owned by the H. A. MacFarland, Inc., and Mauser Mfg. Co. The Rogers Williams Silver Co. and the plants of the Roger Williams Silver Co., and H. A. MacFarland, Inc., were moved to the factory of the Mauser Mfg. Co. The Rogers Williams Silver Co. business was started as the Howard & Co., Inc., and was later known as the Howard Sterling Co. before it was reorganized as the Roger Williams Silver Co.